Shaalom 2 Salaam: A Muslimah's Journey Along the Way From Judaism to Islam: Large Print Qur'an? 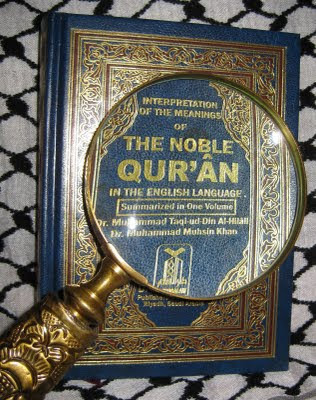 I've been looking for a large print Noble Qur'an for a person who is almost legally blind. She can see a little bit, but needs real large print, or print large enough so she can hold the book close. There doesn't appear to be such a Qur'an. There are large print Bibles and Torahs, but no large print Qur'ans. Does anyone have any ideas, or resources I have not checked? Did you try halalco.com? Audio? DVD? I know there are Braille Qur'ans but they're big and expensive. Try contacting the committees at masjids who work on accessibility - most of the major Shia masjids have such a committee, I would guess Sunnis do, too? I think there is MUCH work to be done, though. I have a friend who is a blind Muslim, but she is totally blind, so large print doesn't do anything for her and so she wouldn't know about it. She does braille and audio. I went to Amazon.com and searched for "quran large print" and several choices came up. Might be worth exploring. Maybe You can find something like that with English,if needed. Yes, there is MUCH work to be done. It's exasperating. I'm going to check with the blogger, Ginny, Insha Allah. She may know. Sis I'd like to point something out and didn't know where to write this. You commented with "Hostage taking is not Islamic" on a Gilad Shalit photo, but actually, Gilad Shalit is not a hostage, he's a prisoner of war, Hamas is at war with the Israeli Occupation forces and Gilad Shalit was a soldier, not a civilian. Islam is OK with these cases so long as the prisoners of war are well treated and not subject to torture or misbehavior of any kind. Funny..I thought you were telling us readers where to get the large print Qurans LOL. Sorry, I can't help you wit this one. Salaams A'ishah: Jazaka Allahu Khayrn! Salaams Solitude: I'm doing some research on the subject. Insha Allah I'll do a post on it when I'm done. JAK for information! Every year at my work we have a community day and the organisation we have for Muslims gives out hundreds of free Qur'ans and other Islamic Lit. The one guy who is in charge of getting the books and other lit. always has some stuff on hand and I have sent an e-mail to him tonight to see if he has one. I know we had Spanish, Turkish, Chinese, Indonesian, Korean and Ahmaric (Ethiopin) copies...........maybe he'll have a large print one, Insha'Allah. Has she considered audio books? I know it's not the same, but it's at least an option until she can have a suitable print edition. I am not really commenting on where you can find a large-print Quran, but I just want to say that even I am looking for one. I know a lady in the nursing home that I visit, but she cannot see too well. She needs large-print text. I wanted to give her a Quran, but the one I gave her was semi-large print but there were no spaces between the lines. Hence, I am also looking for a good large-print Quran that is also easy on the eyes. I want her to read it as much as possible. It's so exasperating. Maybe I will approach some publishers of the Quran and ask them to consider printing one in English. I think there is probably a big need. For prisons, the other issue is finding one that is not hardback. If I could find a hardback one, I could perhaps ask Medical to make an exemption for this inmate, Insha Allah. I, too, have a nice one in large print in Arabic.